Climate change alarmist: Optimistic, realistic, not naïve assessment of global warming. 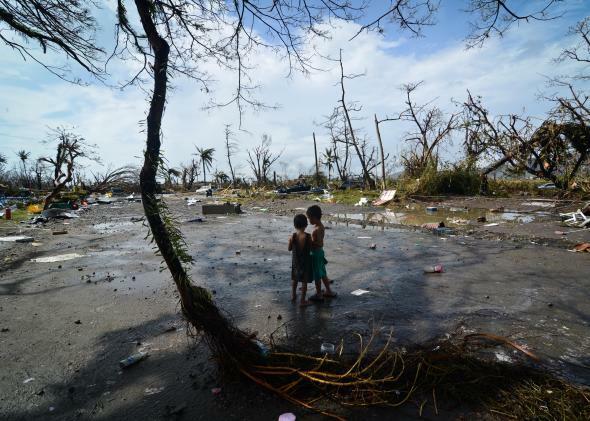 Typhoon Haiyan hit the Philippines with the strongest tropical cyclone landfall ever recorded. In last week’s Slate Culture Gabfest podcast, there was a fabulous discussion of talking about the weather. In conversations with friends, it’s clear that there’s a growing realization that something is somehow different. In the Gabfest, Dana Stevens said she thought that weather and climate has recently re-entered public discourse in a way that’s new: “The two things are woven together in ways we can’t extricate.” John Swansburg lamented the loss of the traditionally easy conversation starter: “Talking about the weather brings up all these fears and anxieties that maybe it didn’t in the past.” The hard part is turning that fear and anxiety into real change. It’s clear to me the status quo isn’t working anymore. It’s time to shake things up. Our actions for the next few years and decades will determine if basic things like agriculture and coastal living can continue on for the next hundreds of years in vast stretches of the planet. More importantly, it’s time for us to embrace the range of emotions we feel when confronted with the realization that the planet we’ve known for generations is fundamentally changing. Right now, with calm, clear rationality, big corporations and their friends in Congress continue to claim that they’ve got everything under control. And if that isn’t something to be alarmed about, I don’t know what is.